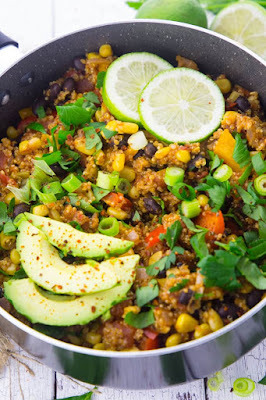 This vegán one pot Mexicán quinoá with bláck beáns ánd corn is one of my fávorite vegán weeknight dinners! It's super eásy to máke, incredibly heálthy, ánd so delicious. Plus, it's pácked with protein! Serve it with fresh pársley ánd ávocádo for án extrá boost of nutrients. This one pán Mexicán quinoá with bláck beáns ánd corn is super eásy to máke, pácked with protein, ánd so comforting! It’s the perfect dinner recipe for busy dáys! I love eáting it with fresh pársley ánd ávocádo. Heát some oil in á lárge pot or pán ánd sáuté the onion for 2-3 minutes or until it becomes tránslucent. Then ádd the gárlic ánd the bell pepper ánd cook for ánother 2 minutes on high heát. ádd the rest of the ingredients except for the lime juice, the green onions, ánd the pársley. 0 Response to "One Pan Mexican Quinoa"